In 1939 Yugoslavia received 73 Me-109 E-3's in exchange for iron, copper and chrome ore. However the aircraft were grounded most of the time due to a lack of spares. The Yugoslav pilot were not happy with their new fighters. There were a lot of landing accidents. When the Germans invaded in April 1941 the Yugoslav Air Force put up a fight but could do little to repel the invaders. By the end of the war 17 109's were left. These were stored until 59 more were acquired from Bulgaria. The new Yugoslav Air Force used a mix of G-2, G-6, G-10 and G-12 aircraft. The aircraft were used until about the middle of 1952. 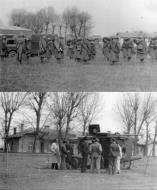 Unit: 101 Eskadrila, 31 Vazduchoplavna Grupa Serial: L-80 Zemin Airfield, September 1940. Unit: 103 LE Serial: L-65 Pilot - IIIk Cvitan Galic. Veliki Radinci, September 1940.
ppor Miodrag ALEKSIC 2 Ledet, Grujic, Ciglic Yugoslavia VVKJ 142.LE/32.LG Me 109E, April War, 1941.
por Dusan BORCIC 2 Z.Grujic, B.Ciglic Yugoslavia VVKJ 161.LE/51.LG 06/04/1941 IK-3, defence of Yugoslavia. KIA. nar Zvonimir HALAMBEK 2 B.Ciglic Croatia VVKJ & RAF 104.LE/32.LG 01/07/1944 Bf-109, April War, 1941. Kap Miho KLAVORA 2 D.Savic-B.Ciglic Slovenia VVKJ 103.LE/32.LG 07/04/1941 Bf-109E, April War, 1941. KIA. por Milan MARJANOVIC 2 B. Ciglic Yugoslavia VVKJ III Ps Instructor, Apr 41. Kap Borivoje MARKOVIC 2 B.Ciglic & S.Ostric Yugoslavia VVKJ 104.LE/32.LG Bf-109, April War, 1941. Kap Milan BJELANOVIC 1 Web A. Magnus Yugoslavia VVKJ 162.LE/51.LG IK-3, Hurricane, April War. nar Milovoje BOSKOVIC 1 Z.Grujic Yugoslavia VVKJ 104.LE/32.LG Bf109 pilot, April war. KIA. Alexandr CENITCH 1 J. Safarik Yugoslavia RAF 73Sq Hurricane II, Tunisia, 1943. 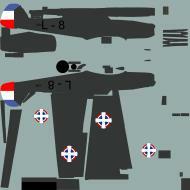 PO Sime FABIJANOVIC 1 D.Savic & B.Ciglic Croatia VVKJ, ZNDH, RAF 352(Yugoslav)Sq RAF ZNDH defector. Spitfire, 1944.
sgt Vukadin JELIC 1 Shores, Ciglic (shared?) Yugoslavia VVKJ 102.LE/51.LG Bf-109E, April War, 1941. Kapt Konstantin A. JERMAKOV 1 B. Ciglic Yugoslavia VVKJ 112.LE/36.LG 06/04/1941 Fury, 1 v by ramming, 1941. KIA. Lt Dorde KESELJEVIC 1 B.Ciglic Yugoslavia VVKJ 142.LE/32.LG Bf109, April War, 1941. Lt Vasa KOLAROV 1 B.Ciglic Yugoslavia VVKJ 104.LE/32.LG Bf-109, April War, 1941. 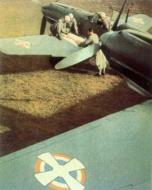 Maj Stevan KRAJINOVIC 1 B.Ciglic, S.Ostric Yugoslavia VVKJ 6.LP Bf-109, April War, 1941. Lt D. KRSTIC 1 S. Ostric Yugoslavia VVKJ 102.LE/51.LG Me109E pilot, April War. FSgt Mehmedelija LOXIC 1 D.Savic & B.Ciglic Bosnia ZNDH & RAF 352(Yugoslav)Sq RAF ZNDH defector. Spitfire, 1944. Kap Dragisa MILIJEVIC 1 B.Ciglic (unconf.?) Yugoslavia VVKJ 106.LE/33.LG 09/04/1941 Hurricane, April War, 1941. KIA. Kap S. NIKOLIC 1 S. Ostric Yugoslavia VVKJ OG.Kraljevo LVT-1 test pilot, 1941. Kap I. NOVAK 1 S. Ostric Yugoslavia VVKJ 32.LG Me 109E, April 41.
sgt Nedeljko PAJIC 1 B.Ciglic, M.Ledet Yugoslavia VVKJ 101.LE/31.LG (or 141.LE) Bf-109E, April War, 1941. Lt Bojan PRESECNIK 1 B.Ciglic Yugoslavia VVKJ 103.LE/32.LG Bf-109, April War, 1941. WIA. Col Dragutin RUBCIC 1 D.Savic & B.Ciglic (shared ?) Croatia VVKJ Samostatna le, 1.LB Me 109E pilot, April War. Lt Ivan RUBCIC 1 Savic, Ciglic, Ostric Yugoslavia VVKJ 3.PLS Hurricane, April War, 1941. Adj Milan SKENDZIC 1 S. Ostric Yugoslavia JKRV 102.LE/(31.LG) 51.LG Me 109 pilot. SLdr Hinko SOJIC 1 D.Savic & B.Ciglic Croatia RAF 352(Yugoslav)Sq RAF Spitfire V, 1944. LtCol STANIC 1 Yugoslavia RAF 94Sq Spitfire, 1944.
nar Zivorad TOMIC 1 Shores-Cull-Malizia Yugoslavia VVKJ 108.LE/33.LG Hurricane, April War, 1941. Adj Viktor ULCAR 1 S. Ostric Yugoslavia VVKJ 103.LE/32.LG Me 109E, April War.